Ethiopia: Local Leather Firm Branches Out to Washington, D.C. While ZAAF has been sold online, this is its first branded retail venue outside of Addis Abeba. 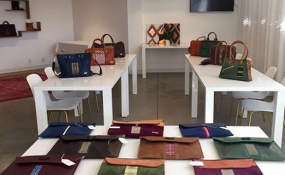 ZAAF Collection, a local leather company that manufactures handcrafted leather goods and accessories, is opening its first overseas store in Washington, D.C. Located on 14th street, dubbed the most chic neighbourhood in Washington, the store opened its doors on December 1, 2018. It will retail handbags, weekend and travel accessories, scarves, leather jackets and fashion accessories handcrafted by artisans in Ethiopia. Established in 2014 with an initial capital of 10,000 dollars by an Ethiopian member of the diaspora, the company has been selling its products at its outlet located in Bole District. Up until now, the company has also been distributing its products to local resorts and boutiques. "The area has become popular for gift shops, luxury stores and trendy restaurants," explains Abai Schulze, founder and creative director of ZAAF, on why she chose the location. "We will also have products made by [other] African designers." Founded by Abai, who was born in Wollo and was adopted by American parents at the age of 10, the company used to operate with five staff members on two collections. Now the number of employees has reached 17 with a production capacity of 150 to 200 bags a day. ZAAF sources all of its raw materials locally. ZAAF, which means tree in Amharic, targets a customer base of young professionals in their mid-20s who are fashion-conscience and tech-savvy. The company aims to engage them through social media platforms, according to the founder. The company will be joining 24 other industries in Ethiopia that export finished leather products. During the past fiscal year, the export of leather and leather products has generated 135 million dollars. In the country there are 32 tanneries, 24 medium and large-scale footwear manufacturers and 398 small and micro enterprises that produce leather products. The government is providing assistance and support for export-oriented companies, according to Berhanu Serjabo, public relations director at the Ethiopian Leather Industries Development Institute under the Ministry of Trade & Industry. "We are providing technological and technical assistance, including conducting research for the growth of the sector," Berhanu, told Fortune. During 2017, the leather industry created a total of 17,000 job opportunities. Dagmawit Tesfaye, a designer and founder and owner of Dag Clothing Line, believes ZAAF can penetrate the international market. "The fact that their products have Ethiopian culture and attributes gives them a competitive edge in the ever trendy fashion world that looks for unique ways to express itself," said Dagmawit. She argues that there is a huge market potential for Ethiopian products made by artisans if they can improve their quality and work on their marketing. ZAAF is not the first Ethiopian leather production company to open shops overseas. SoleRebels, a footwear company founded in 2004 by Bethlehem Tilahun, makes shoes from recycled materials and has several retail shops around the world.